What would Napoleon do if he suddenly found himself face to face against an army of Orcs armed to the teeth with guns and swords? 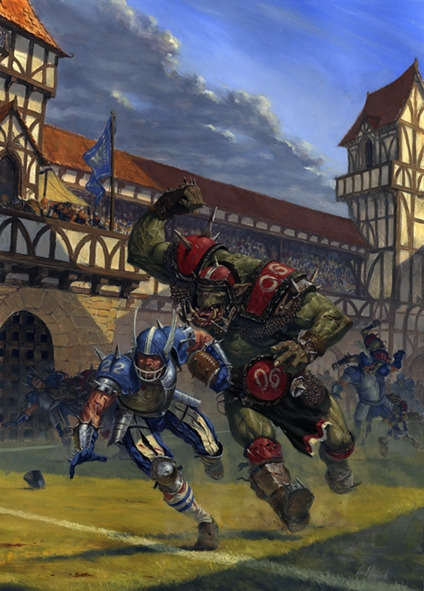 What would a football game between said Orcs and heavily armored humans look like? 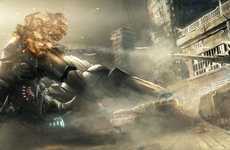 Thanks to Karl Kopinski, a British artist who has worked with Warhammer owners 'Games Workshop,' as well as 'Magic: The Gathering' producers Wizards of the Coast, we don't have to wonder quite as hard. You may not have known that you were wondering what an 19th century general would look like next to a dragon, but you were. It takes someone very passionate the effectively mix the fantasy sci-fi world of Warhammer with the eclectic and classy stylings of 19th century canvas paintings, but Kopinski has certainly pulled it off.